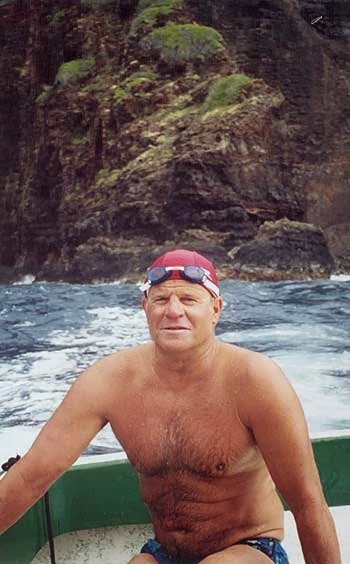 After a lifetime to doing unprecedented swims around the world, David Yudovin (U.S.A.) was selected for enshrinement in a special election by the International Swimming Hall of Fame (ISHOF) as an Honor Open Water Swimmer. Yudovin is one of the most prolific marathon swimmers in history, known for pioneering channel swimming firsts that span the globe. The Californian is an Honour Swimmer in the International Marathon Swimming Hall of Fame, a lifetime member of the Catalina Channel Swimming Federation, a lifetime member of the Santa Barbara Channel Swimming Association, and a member of the Half Century Club. Yudovin began channel swimming in 1976 and has remained active for the last 38 years as an athlete, pilot, support crew and mentor. Yudovin has completed over 35 marathon and channel swims that has included 15 firsts. He and his wife, Beth, are also currently very active volunteers in their community, after retiring in 2005 from three seafood related companies they founded and ran for over 25 years. Yudovin is now involved in public speaking to raise money for the City of Hope Cancer Center, Senior Nutrition, Cambria Community Bus, and North Coast Ocean Rescue, and the Cambria Fire Department. Maybe not the most significant achievement in his life but David Yudovin started the Tulsa Masters Swim Club, (Registered as TULS with USMS) in 1979 and is still active. In fact it is the largest and most active of 5 USMS registered clubs here in Oklahoma. David introduced me to Masters swimming, pool & lake. There are 5 of about 10 founding members of the Tulsa Club that are still active in swimming. Three of those are still competing.